It’s early in the morning, and the happy burble of the coffeemaker is gently encourage me wake up. It’s an hour’s walk from my place to the NIKE campus, and I have scheduled commitments, so everything from the alarm going off to arriving at the office is carefully planned out. Today’s first surprise comes as I step out of the house: there’s hoar frost covering everything! It’s actually cold; I’m prepared for rain (with Gore-Tex) but not for cold. I could turn around and grab a fleece but I decide to embrace the chill, and instead I step onwards. I’m in an area bounded by Hillsboro, Aloha, and Beaverton. It’s a scrambled mix of rural and suburban, with lots of greenbelt swirled in. One of the first things I see is a creek that weaves through my neighborhood, with a tiny cabin adorning the landscape. Sidewalks seem to be the exception here, rather than the rule. There’s very little vehicle traffic, so I face the occasional oncoming cars and remain mindful of who would win in a contest with the two. It’s quiet. No birds chirp, the chilling breeze is constant but quiet, and only a leaf blower in the distance breaks the silence. After a half-hour strolling between trees that are 20 times my height (!) I leave the forest, stumble over a curb, and am back in suburbia. Soon I cross the MAX Blue Line and my office building comes into view. Here’s our “pod”, where the baker’s dozen of us sit (when we’re not off at one meeting or another). The lighting is subdued and soothing; the sound is muted and quiet, without any ringing phones or long conversations with salespeople (both of which I’ve encountered in office life). One of the very cool things about the NIKE office ethos is the choice of whiteboard material as the covering for all desks and a lot of the wall space. People are constantly scribbling notes on every surface, swirling drawings with boxes and arrows, furious note taking during detailed conversations. It’s a little quirk, but a charming one. The nameplates with the swoosh logo is another nice touch. The NIKE campus is a series of pretty buildings set into a wooded setting, with a creek bisecting the main area, jogging paths encircling the whole collection. There’s an impeccably groomed huge grassy area in the middle, perhaps a soccer field, with several “cardboard coyotes” strategically placed near the middle. When I inquired why, I was told it was to scare away the Canada geese. With the geese alighting everywhere else, I think the coyote are doing their job well. Walking between the buildings I come across the lake in the middle. There are café-style tables and benches everywhere, with laptop-wielding employees perched here and there. Today is uncharacteristically sunny; I’m told I’ve brought California weather with me. Here’s a view of the creek and greenbelt that bisect the campus. Here’s one of the parking structures, adorned with a mural across one side. This is the soon-to-be-opened parking structure. 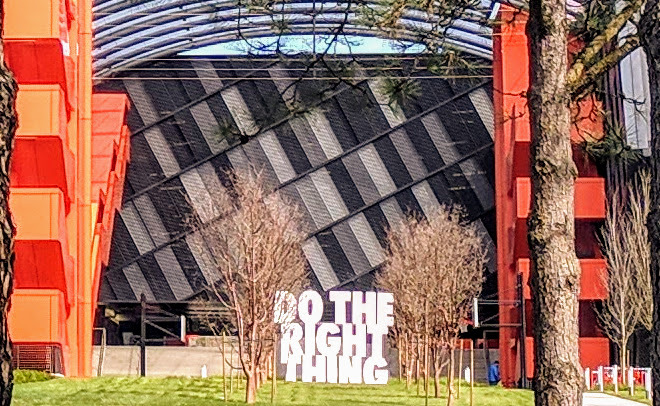 What looks like a white square in the middle of the photo is actually the phrase “DO THE RIGHT THING” in huge 3D block letters. My workday done, I start the walk home, coming across an explosion of a flowing plant and it’s neighbor, a rusting mailbox. And that’s one view of the NIKE campus. I’ll cut across it via another chord and share that view in the coming days. Thanks for walking with me.